One of Cheltenham’s major attractions is its racecourse. Being the home of the ‘steeplechase’, Cheltenham attracts many visitors to its town in March, when the Cheltenham Gold Cup is raced at the Cheltenham Festival. Swapping four legs for four wheels, Cheltenham is the ideal place to take up driving lessons! Ignition Driving School can help you to overcome any hurdles along the way too with our online pupil support centre, full of lesson aids and theory practice papers. 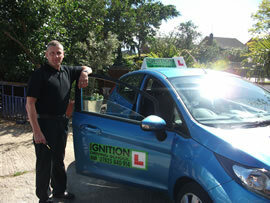 The bets are on at Ignition Driving School that you will succeed in your aim of passing your driving test. We are passionate about making your driving lessons an enjoyable experience and aim to be as flexible as possible. We can offer you driving lessons throughout the week and weekends, at no extra cost, provide intensive driving courses or hourly driving lessons and ensure that all our driving tuition is one-to-one, so your driving instructor’s next pupil won’t be sitting in the back of the car on your driving lesson. I have really enjoyed learning to drive, I found that my instructor was extremely good at explaining each lesson. And very soon I was driving into Cheltenham, where I planned to take my test, which I found very useful. The reason I chose Ignition Driving School was because of the good value for the lesson, which were the best priced I found.